Motorola’s Moto X is the Google-owned phone maker’s latest flagship device. The Moto X is a customisable NFC handset that lets customers choose from more than 2,000 combinations of colour, cover, memory and wallpaper and specify their new phone using an online tool. Two unique features of the device are its ability to listen full time for verbal instructions from its owner through an ‘always on’ voice input system, and its ability to wake just portions of its display to show new notification messages. Running Android 4.2.2 on a customised Qualcomm dual-core 1.7GHz Snapdragon S4 Pro that the company has dubbed the Motorola X8, the Moto X boasts a 4.7-inch 720p Amoled screen and 10 megapixel autofocus LED flash camera. A phone believed to be the Moto X, then widely referred to as the X Phone or XFON, passed through the FCC’s approval process in the US in mid-May 2013. Moto X was announced in early August 2013 and will be available first in the US, Canada and Latin America from late August/early September. 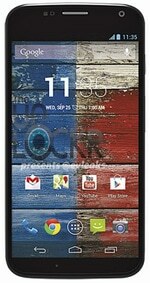 AT&T customers in the US will be the first to have access to the Moto Maker online customization tool.